A reservoir in a continuous-flow oxygen system in which oxygen exhaled by the user is collected for recirculation in the system. A forced-flow, once-through, convection-heat-transfer tube bank in which feedwater is raised in temperature on its way to the evaporating section of a steam boiler, thus lowering flue gas temperature, improving boiler efficiency, and saving fuel. a component of a boiler unit. 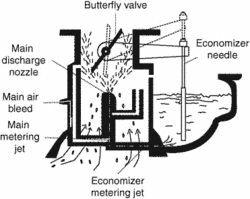 An economizer is a heat exchanger in which feed water is heated by flue gases before the water is supplied to the boiler. For a pressure of up to 22 kilograms-force per cm2 (2.2 megapascals) and a feed-water temperature below the dew point of the flue gases or for water that has not been deaerated, an economizer consisting of plain cast-iron tubes or of finned cast-iron tubes is used. For higher temperatures and pressures, an economizer consisting of steel tubes is used; most economizers of this type consist of plain steel tubes. An economizer increases the efficiency of a boiler unit. i. 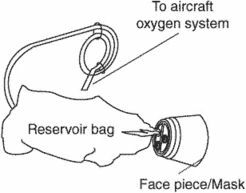 A reservoir in a continuous-flow oxygen system in which exhaled oxygen is collected for recirculation in the system. This way the consumption of oxygen is economized. ii. The system of metering additional fuel in a carburetor or fuel injection system when the throttle is wide open. This additional fuel helps remove some of the heat when the engine is producing maximum power. The system provides an economical fuel-air mixture at all settings except at full power. Also called a power-enrichment system or a fuel economizer system. In fact, as greater savings are being sought in the health sector, the investment in retro-fit economisers is proving to be a prudent one. Fulton's Economiser can be installed in all gas-fired RBC models at the build stage with no overall effect on footprint. 200 9) carried out laboratory tests on an EVI machine (both air conditioning and heat pump applications) with R-410A as working fluid in both the capillary tube and flash tank and thermostatic expansion valves and economiser configuration. The addition of the pre-stripper section increases capacity and improves final product quality since it allows physical refining of the oil, while the addition of a VHE Final Economiser reduces energy consumption while also improving product quality. Le ministre de l'Electricite, Dr Hassan Younes, a pour sa part souligne que les lampes d'energie economique contribuent a economiser entre 60 et 70% de l'energie, en comparaison avec les autres, et que c'etait la une tendance internationale adoptee dans les pays developpes. The economiser recovers useful heat from the boiler exhaust gas which is used to preheat the boiler feedwater; this can increase boiler efficiency up to 95%. The economiser seen here in the photo is a drawer type for ease of maintenance and located above the rear smoke box. The WELLMAN ROBEY Economiser Retro-Fit range enhances boiler efficiency by between 5 and 7%, in addition to maximising waste heat recovery due to the large heat transfer surface areas. ltsh, Economizer,cassette baffles of ltsh and economiser, Alignment bands and mechanical spacer bars of ltsh and adjustment and fixing during aoh 2017-18 of boiler/stage-iv/dr. Babcock Wanson UK with its resources backed by the international energy group CNIM, says it has always had a keen eye for efficiency and with its current range of advanced industrial steam boilers have been refining both the design and cost of feed water economiser units to provide that sought after combination of effective design, simplicity, long life and low cost.